MOORE COUNTY, NC – Firefighters from 5 different departments responded to a large barn on fire threatening a residential home approximately 100 feet away. Responders were called to the incident at 1380 L Cooper Road around 6:00 PM Wednesday evening. The first arriving fire units reported a two story barn with a basement that was fully involved in fire with heavy flames and smoke coming from the structure. Firefighters immediately began protecting a nearby home and two large LP gas tanks that were close enough to the fire that the siding on the rear of the home had begun to melt from the intense heat from the fire. These efforts from the responders prevented further damage to the home and stopped the gas tanks from possibly exploding. Additional firefighters began attacking the barn fire with multiple large hoses. Firefighters had to work by hand to remove layers of metal roofing and siding that had collapsed in onto the burning barn. Water had to be shuttled to the scene of the fire from a hydrant over a mile from the scene of the fire. Firefighters used tanker trucks to bring water to the fire supplying the engines that were operating the pumps spraying water onto the fire. L Cooper Road was totally blocked to traffic so that emergency equipment could get in and out of the location of the fire. The barn was a total loss in the fire. There were no injuries reported in this incident. 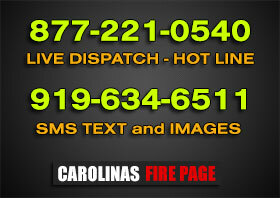 Responding to this evenings fire were units with all three stations from Cypress Point Fire & Rescue, Crains Creek Fire Department, Whispering Pines Fire Rescue, Southern Pines Fire & Rescue, Seven Lakes Fire Department, Moore County EMS, Moore County Fire Marshal’s Office, and the Moore County Sheriff’s Department.